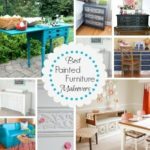 I’ve joined a group of friends for a challenge to makeover a piece of furniture each month with a theme. April’s theme is “bright”. 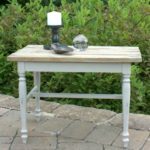 It was a quick decision for me to decide to give the garden bench that resides on our screened porch an update with a bright coat of paint. 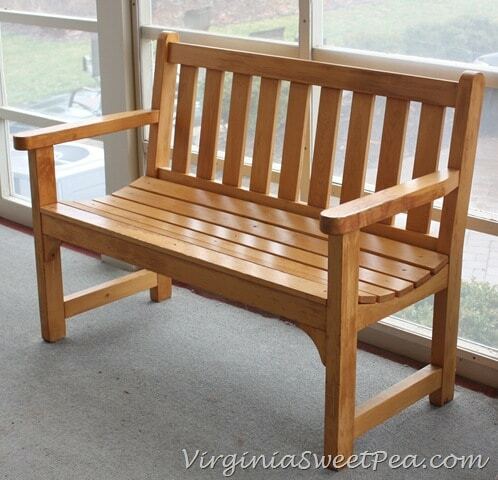 This bench purchased from Plow and Hearth was a gift from me to Mr. SP very early in our marriage. It has resided on our screened porch for nearly 20 years now and has been sat upon countless numbers of times. 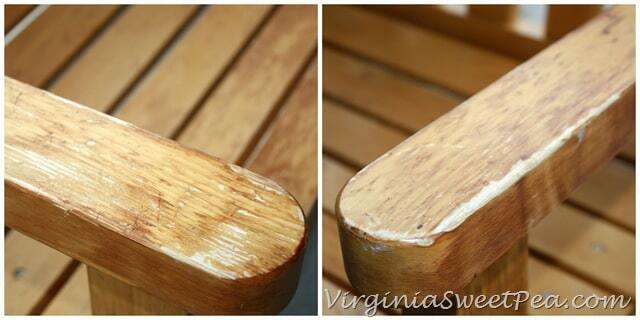 The bench was still in excellent condition but had some wear and tear on the arms. 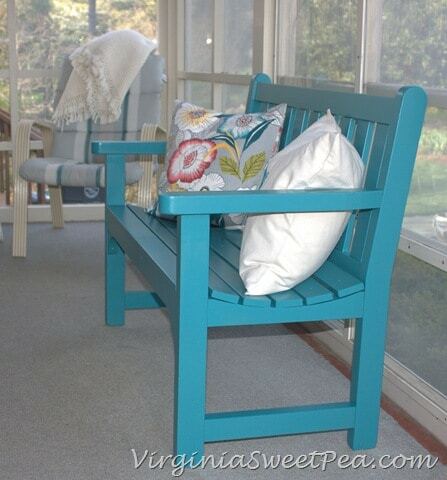 After sanding the bench to smooth down the arms and to take off some of the smoothness of the stain, I painted the bench Valspar Tidal Teal in gloss purchased from Lowe’s. 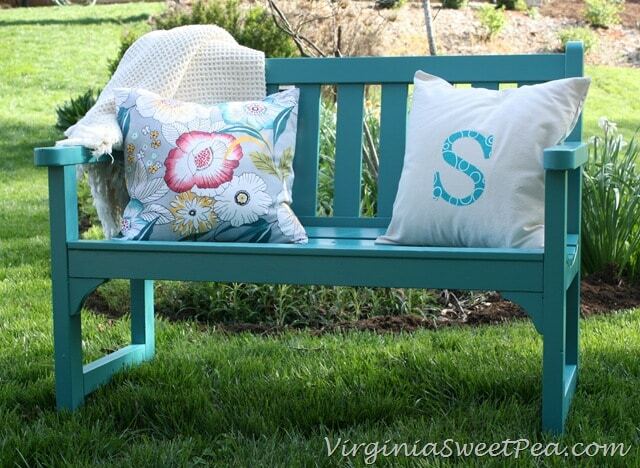 Using my HomeRight paint sprayer made painting this bench a breeze! 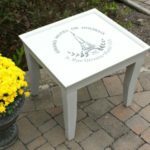 After three coats of paint completed over two days, my bench looked like new! My yard is so lush and pretty right now that I couldn’t resist taking a few pictures of my bench outside before I moved it to its home on the porch. Two envelope pillows made with fabric leftover from my guest bath curtains jazz up the bench and offer comfort when relaxing on it. 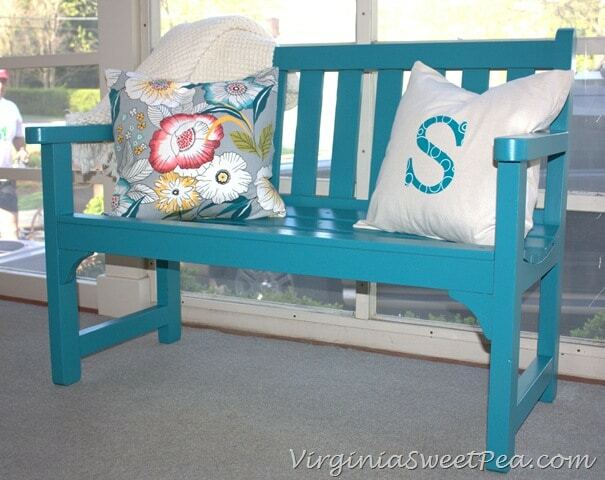 The bright color of the bench makes me smile every time I walk out onto our porch. I’m hoping that the next update to our porch will be new carpet. 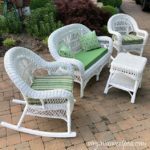 I’m looking forward to spending spring and summer evenings relaxing on our porch! 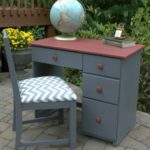 Don’t miss my friends’ brightly painted furniture makeovers! Click on the pictures below to visit each project. Thanks, Christy! My grass is going to be really lush after all of the rain we’ve had this week! Thanks, Bev! I am so pleased with the end result of this project. Terrific teal Paula! I love your bench redo! Hey, you mentioned new carpet…why not paint it instead? Whatcha think? We could paint but I’d have to add something to it to make sure the surface wouldn’t be slick. We use our porch as a main entrance, so we are on it a lot with wet shoes (and a wet dog) and I wouldn’t want to fall. If we choose carpet, I’m going to get something that will hide the dirt! This looks beautiful Paula! I LURVE the color you picked!!! 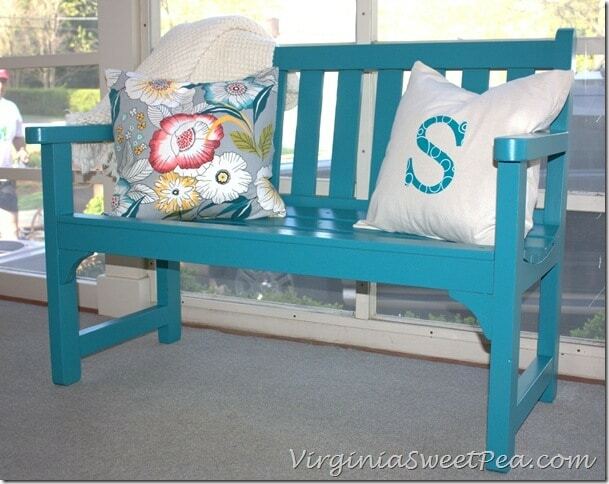 Paula, Love the color you selected for the bench and the pillows are just perfect! I haven’t used my sprayer in a while but I’m sure I will now that the weather is getting nicer. I probably couldn’t have finished this project in time without using the sprayer! It’s fun to use it to paint something so quickly! That color is GORGEOUS Paula!!! I love it…it’s just perfect! Thank you! 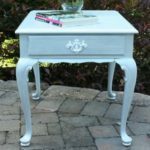 It’s the first brightly colored item that I’ve painted for my home and I love it. I have paint left, so something else is going to get a shot of turquoise! Paula I love the color you chose- that blue is fabulous! What a bright and beautiful update for your porch! Thanks, Jen! I’m loving the bright update! Thanks, Cassie! I like that color, too, and since I have some left, I can use it for another project. 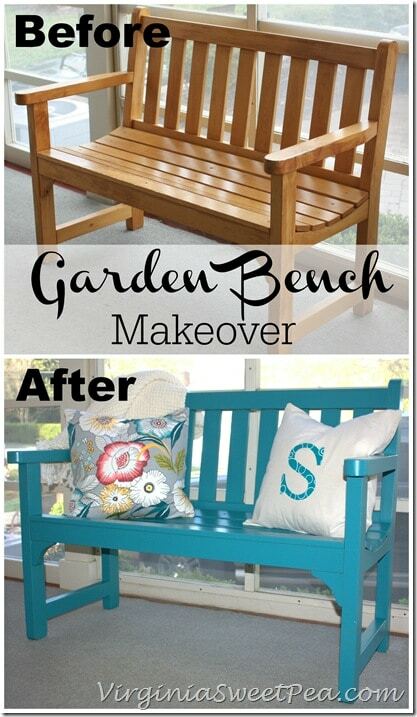 I love this makeover! The color is so fresh and bright! It brings a lot to your porch. The pillows that you matched with them are beautiful as well. Thank you! I love the pillows, too, and they were quick and easy to make since I had the supplies on-hand. The carpet on the porch is what I want to tackle next! Love the color, so bright and cheerful! Great job Paula! Paula, this is simply beautiful! I so love the color and the pillows – you did a fantastic job! Pinning! Happy May Day! Thanks, Cindy. This was a fun makeover! I love your “new” bench! I love the color and the pillows. Also, I can’t believe I wasn’t following you on Instagram. I am now. Hope you have a wonderful week! Can’t believe it’s already May!! So pretty! 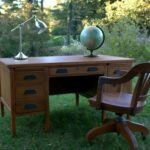 I am somewhat new to furniture makeovers. 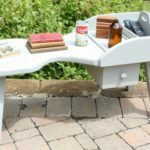 What did you use to sand your bench? 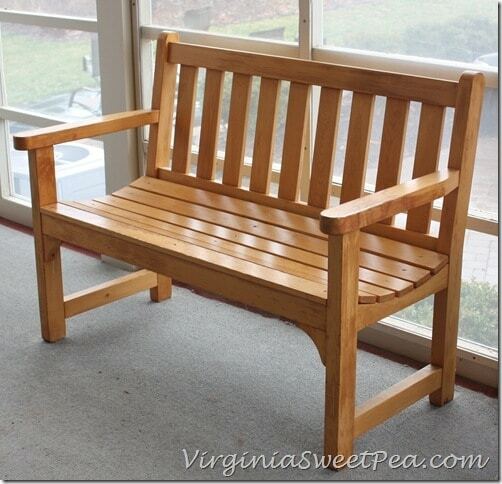 Your bench looks fantastic! 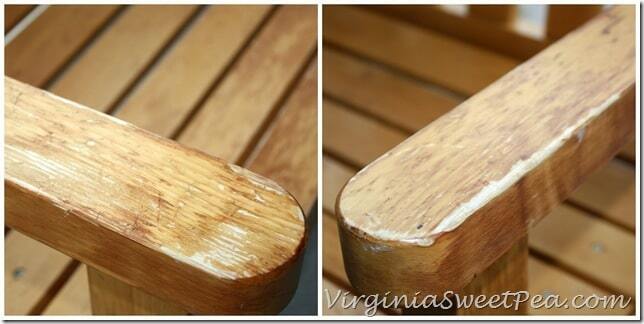 Lauren – I used a palm sander to sand the bench. The arms needed a heavy sanding but the rest of the bench only needed a light sanding to help the paint stick. Paula, I always enjoy seeing your before and after projects and you always do such a great job! 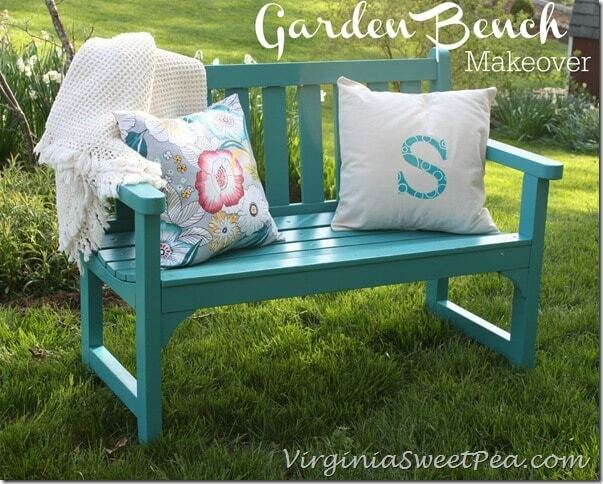 I love the color of your bench! I saw one almost just like yours in a high end magazine yesterday and I was thinking that yours was prettier! I’m so glad you shared it at our Pretty Pintastic Party! Thanks!! What a sweet color and gorgeous place to sit and enjoy the outdoors….like it! Gorgeous, gorgeous, gorgeous! Love the color you chose and how you dressed it up. So perfect for spring and summer. Thank you so much! I am so much enjoying the pop of color it gives my porch. I love this bench!! Blue is my favorite color, so good color choice;) I am pinning this, thank you. Thanks, Kathi! I’m glad that I have paint leftover to use for another project. You are a nice friend, Katie! I’ll bet that your friend loved the bench that you made for her. Thanks so much for taking the time to comment. Visiting from the Home Sweet Garden party. Love the turquoise, it looks fabulous. Thanks tons for linking to Inspire Me. How fun!! With the pillows it looks just stunning. This turned out beautifully, Paula! Such a fun project. I love your choice of color! Thanks so much, Kristi! I wasn’t sure about the green but after I finished, I loved the color. Thank you so much, Heather! I’m thrilled to be featured.